1) (Earl of Huntingdon. Sir William de Clinton was summoned to Parliament 1330, and created Earl of Huntingdon 1337; earldom extinct, 1354). Ar. six cross crosslets fitchee sa. three, two, and one, on a chief az. two mullets or, pierced gu. 2) (Welwyn, co. Herts). Ar. six crosses crosslet fitchee sa. three two and one, on a chief az. two mullets pierced or. Crest—Out of a ducal coronet gu. five ostrich feathers ar. banded by a ribbon az. 3) (co. Warwick). Paly of six or and az., a fesse erm. and a canton of the first. 4) (co. Warwick: arms of Sir John de Clinton, of Coleshill, temp. Edward III., fifth in descent from Osborn de Clinton, temp. Henry II., nephew of Geoffrey de Clinton, a Norman; Johanna, dau. and heir of said Sir John, m. Sir John de Mountford, 27 Edward III., 1352). Ar. on a chev. az. two fleurs-de-lis or. 5) (co. Warwick. Arms of John de Clinton, of Maxtoke, nephew of Sir John de Clinton, of Coleshill). Ar. on a chief az. two mullets or, pierced gu. 6) (Wiltshire). Ar. a chief az. 7) Ar. on a chief az. two mullets of six points or, piCresthe first. 8) Paly of six or and az. a chief erm. 9) Sa. on a bend ar. three mullets pierced gu. 10) Or, three piles az. a canton erm. 11) Chequy or and az. a chief erm. 12) (also borne by Lacy. See Lact of Ireland). Ar. a fess gu. 13) (or Clynton). (Lecale in Ulster). Ar. six cross crosslets fitchee sa. three, two, and one, on a chief az. three crescents of the first. 14) (Dowdetown, co. Louth; Margery, dau. of Thomas Clinton, of that place m. James Crelie, of the Newry. Fun. Ent. Ire., 1618). 15) Ar. six cross crosslets fitchee, three, two, and one, sa. on a chief az. three mullets of the first, a border gobonny gu., and of the third. This is a local surname meaning “of Glinton”, a parish in county Northampton near Market Deeping. The letter G eventually evolved into a C, a common phenomenon in nomenclature (ex. Caunter, Crane, Candlin, Clendinning). Another source claims the Duke of Newcastle (who descended from Reinbaldus who came to England during the Conquest) bore the last name is derived from Glimpton, an estate in Oxford, and that this locale maybe the true birthplace of the surname. Another source claims that this is Dano-Norman local name deriving from the word klint, a brow of a hill or cape and ton, a town. Glimpton was a town on the Glym river,, which was named by the Celts and means “bright stream”. The city was first documented in 1060 AD. It should also be noted it’s related to the Middle Low German Word glinde, meaning a fence or enclosure. It is also a reduced form of the Irish name McClinton. Some claim the family can be traced all the way back to a viking named Tancredus, a companion of Rollo. Others claim the first ancestor, Tancrède De Tancarville, was born in Denmark c. 890 AD. 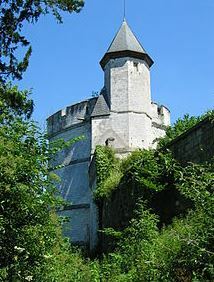 His descendants became Lords of Tancarville in Normandy, France. The family then made its way into England during William the Conqueror’s Norman Invasion of England. Common spelling variants include Clynton, Clinote, and Glinton. The first recorded person bearing this last name was Geoffrey de Clinton, who was documented in 1130 AD in Gympton, Oxon. The Placita de Quo Warranto, Ivo de Clynton in county Salop during the reign of King Edward I of England (1272-1307), as well as William de Clynton of Derby. The Hundred Rolls of 1273 AD, a census of Wales and England, known in Latin as Rotuli Hundredorum, documents three people bearing this surname: Geoffrey de Clinton in county Gloucester, Henry de Clinton in county York, and Thomas de Clinton in county Bucks. Early marriages involving this surname include Anne Clinton to John Green in 1674 AD in Canterbury and Richard Clinton to Mary Gray in 1683 AD at St. James Clerkenwell in London. John, the 5th Baron. 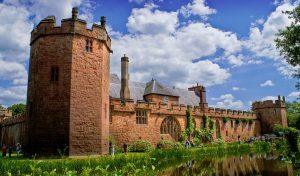 John traded the Manor of Maxtock with Humphrey, Earl of Stafford, for the Manors of Whiston and Woodford in county Northhampton. He was a Yorkist and was attained in 1461, but later obtained favour from King Edward IV. He married Elizabeth Fynes and died in 1464. He was succeeded by his son, John, 6th Baron. This John married Anne, the daughter of Sir Humphrey Stafford. He died in 1488 and left a son named John, the 7th Baron. John married Elizabeth, daughter of Sir John Morgan, and died in 1515. 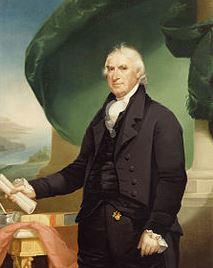 He was succeeded by his son Thomas, the 8th Baron Clinton. Thomas married Mary, daughter of Sir Edward Poynings, and died of sweating sickness in 1517. 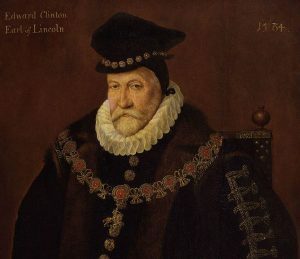 He was succeeded by his son Edward, 9th Baron Clinton and 1st Earl of Lincoln, who was born in 1512. Edward was one of the most prominent figures of his time and he married Elizabeth, daughter of Sir John Blount, with whom he had three daughters. He later married Urusula, the daughter of William, Lord Stourton, and had numerous issue with her, including a son named Henry, the 10th Baron and 2nd Early, who succeeded him in 1584 upon his death. Henry was born in 1540 and first married Catherine Hastings and had two issue with her, Thomas, the 11th Baron, and Edward, from whom the extant Dukes of Newcastle descended. He later married Elizabeth, daughter of Richard Morrison, and had two sons and a daughter with her. He died in 1616 and was succeeded by his eldest son Thomas, the 11th Baron and 3rd Earl of Lincoln. Thomas was born in 1571 and was summoned to Parliament during the reign of King James I as Lord Clinton and Say. He married Elizabeth, daughter of Sir Henry Knevitt. He died in 1618 and was succeeded by his son, 12th Baron, named Theophilius. Theophilus was born in 1600 and married Biridger, the daughter of William Fines, with whom he had children. He was succeeded by his son, Edward, Lord Clinton, who was the 13th Baron. Edward died in 1692 without children, when the Earldom of Lincoln devolved to his souin, Francis Clinron, while the Barony of Clinton went into Abeyance, between the children of his aunts, until it was called out in 1721 to Hugh Fortescue, the 14th Baron. Hugh was made a Lord in 1749 and he died in 1751, when the Barony of Clinton fell back into Abeyance. It later devolved to Margaret, Baroness Clinton, who married the 2nd Earl of Orford in 1751 leaving one son. She later married Honorable Sewallis Shirley. She died in 1781 and was succeeded by her only son George. George was the 3rd Earl of Orford and 16th Baron of Clinton who was born in 1730. His cousin, Robert George William Trefusis, became the 17th Baron. He was born in 1764 and married Albertina Marianna, daughter of John Abraham Rodolph Gaulis of Switzerland. They had three children together: Robert Cotton St. John, 18th Baron, Charles Rodolph, 19th Baron, and Gorge Rolle Walpole Trefusis (captain in the Royal Navy born 1793). Sire Johan de Clinton (1315) assumed the surname Glinton and was written as Clinton. He was created a Baron in 1298 AD, and a long list of Barons of Clinton descended from him. A different branch of the family was found in Hunton of Kent. The book “A Topographical Dictionary of England” by Samuel Lewis states “The manor afterwards passed to the Gyffords, and in the reign of Edward III to the family of Clinton, of whose ancient mansion, the site, encompassed by a boat, is still visible near the church”. Joseph Clinton left the port of London bound to Virginia aboard the Mathew in 1635. Other early settlers include Mary Clinton (Virginia 1636), Edward Clinton (Barbados 1654), Cornelius Clinton (1656), and Charles Clinton (New York 1728). 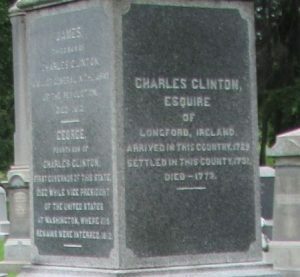 Colonel Charles Clinton was the progenitor of the distinguished family of Clinton in the United States, and he came from Ireland in 1722 and settled in “Little Britain”, which was an area in Orange County, New York. Charles William Clinton (son of Alexander, a doctor and a Lieutenant in the United States Army during the War of 1812 and Adeline A. Hamilton) was born in 1836. He married Emily de Silver Gorsuch in 1886 and had three issue with her: Charles Kenneth (1889), Margery Hamilton, and De Witt (1893). He was a Sergeant in the 7th Regiment. He bore Argent, six crosses crosslet fitchee sable; on a chief Rzvire two mullets pierced or, with Crest: Out of a coronet gules five ostrich feathers argent, banded azure. The Clinton family has the following mottos: 1) Loyaulte n’a honte, meaning “Loyalty knows no shame”, 2) Tout vient de Dieu, meaning “All comes from God”, and 3) Patria cara carior libertas, meaning “My country is dear, but freedom is dearer”. Famous people with this last name include: 1) William Jefferson “Bill” Clinton (1946) who was the 42nd President of the United States of America, 2) George Clinton (1739-1812) who was Vice President of the United States and Governor of New York, 3) James Clinton (1733-1812) who was a General in the American Revolution, and 4) Charles Clinton (1690-1773) who was a Colonel in the French and Indian and father to both the aforementioned George and James Clinton. The two main devices (symbols) in the Clinton blazon are the mullet and cross crosslet fitchee. The three main tinctures (colors) are azure, argent and or . In no. 7, “piCresthe” appears to be an error. Thank you. It’s very coincidental that you found this, as I just found it myself about one hour ago. I will correct.